The SLMD skincare line, which was developed by Sandra Lee MD, is meant to bridge the gap between over-the-counter products and those prescribed by dermatologists. Allowing consumers to have access to effective products, the brand is helping individuals focus on their skin’s problem areas without having to see a doctor. 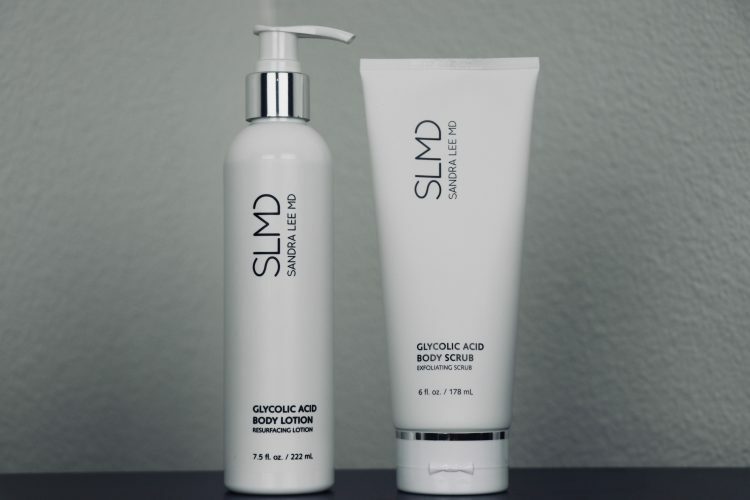 SLMD skincare recently expanded its product line by releasing the Body Smoothing System. The system, which is a treatment set that includes the brand’s Glycolic Acid Body Scrub and Glycolic Acid Body Lotion products, is aimed to give your complexion a smoother and healthier glow. Designed to keep your skin hydrated while helping you treat keratosis pilaris, ingrown hairs, dryness and uneven skin tones, this system is a powerhouse for those struggling with these problem areas. Upon arrival, both products came enveloped in their individual sleek matte packaging. The white design, seemed carefully crafted — simple with no images or graphics. The body scrub, came in a soft squeezing tube that allowed users to easily pour their desired amount while the body lotion came with an easy to use no mess pump. Smothered in a beautiful scent that can only be described as a delightful blend of citrus and floral aromas, the body scrub uses both a chemical and physical exfoliant that leaves the skin smooth, soft and luxurious. The Glycolic Acid Body Scrub is a product that to no surprise comes with chunky beads. On the skin the beads felt gritty and coarse, allowing for it to have a deep exfoliating affect. I had no issues with the texture, though I do think those with extremely sensitive skin may need to proceed with some caution. The scrub, which left traces of its soft scent on the skin helped smooth out any rough patches I had on my problem areas. After using a generous amount of the product for a few days, I noticed that my skin felt no irritation afterwards, which can be a common side effect for products that have chemical exfoliants. In fact, the product left my skin feeling like velvet, ready and prepared for the next step (in this case the Glycolic Body Lotion). This product, which is enriched with Shea Butter and has a slight scent of unisex perfume, is meant to be used after SLMD’s Glycolic Acid Body Scrub. The lotion left my skin moisturized and soothed while helping even a few of my problem areas. Like the scrub, I felt no irritation afterwards. It’s consistency is of regular lotion, no grittiness or texture. The lotions smell wasn’t overwhelming on the skin, and was easily masked by cologne (if you’re looking to hide the scent). The lotion, in combination with the scrub, helped my skin keep moisture and fight an uneven skin tone. I experienced no peeling after using both of the products, which I was excited to see (or not see in this case). Besides allowing consumers to battle skin problems in the comfort of their own home, the system is effective and somewhat affordable. After using the system, I felt that my skin was brighter, felt smooth and healthier. Ultimately, with the Body Smoothing System, you’ll experience deep exfoliation and a hydration like no other. If you’re a guy (or gal) looking to battle uneven skin tones, keratosis pilaris, ingrown hairs and dryness, the SLMD Body Smoothing System is the perfect product for you. Nothing beats the feeling of smooth, luxurious skin. You’ll thank us later. NOTE: The Body Smoothing System was provided by SLMD for the review.